Taste test: These are Herr's version of the standard Nacho Cheesier Doritos, and they're very good. 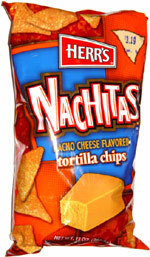 They're not as cheesy as Doritos, but they're very crisp, and the great tortilla chip taste makes up for the lower level of cheese. Good stuff. Smell test: Good cheesy tortilla chip smell.